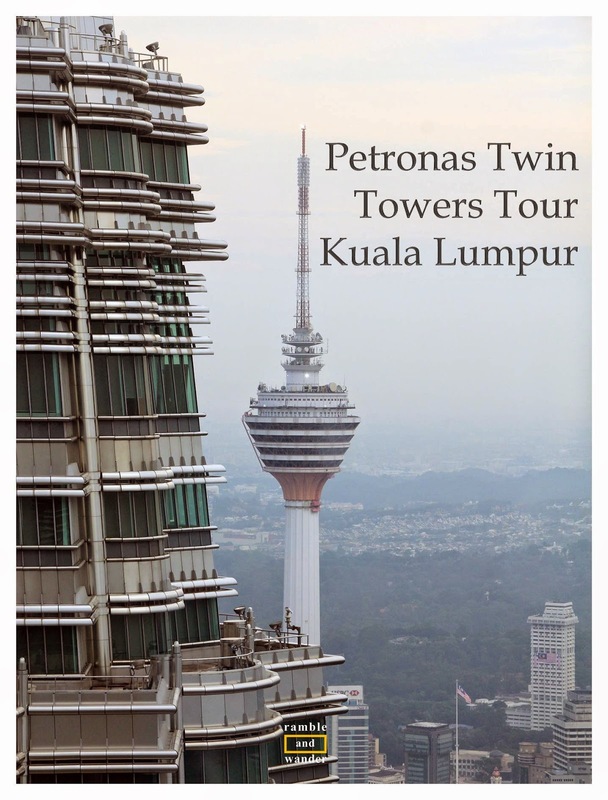 A trip to Kuala Lumpur would not be complete without a visit to Petronas Twin Towers, a major iconic landmark that has come to represent the city and Malaysia in general, on the world map. While many would be happy to just enjoy the sight of the world’s tallest twin towers from the nearby KLCC Park or KLCC Promenade especially in the evening when they are fully lit up, taking a Petronas Twin Towers Tour for a trip up to the Skybridge (on 41st floor) and Observation Deck (86th floor) on Tower 2 can be an interesting experience too. To be on the Twin Towers tour, visitors have to buy a ticket first. This can be done either over the counter or online. Ticket prices differ depending on whether you’re a Malaysian or a foreigner. If you are a non-Malaysian, you can buy the tickets over the counter or online. Tickets are issued on ‘First Come First Served’ basis. It is therefore advisable to buy the tickets online well in advance or at least a few days ahead to ensure that you get the time slot that you want. Tickets can be sold out well in advance especially during school holidays. If you’re the kind who likes to plan well ahead, fret not, the online system allows you to buy tickets up to one year in advance. If you’re a Malaysian, it is better for you to buy the ticket over the counter as the online booking system still does not offer tickets that are priced for locals. Again, it is better to buy the ticket a few days in advance if possible. Ticket counter opens every day (except Mondays) at 8.30 a.m. and closes at 6.00 p.m. Getting to the ticket counter and entrance for the tour could be a bit tricky for those who are not familiar with the layout of the area. If you’re coming from the inside of Suria KLCC (the shopping mall right beneath Petronas Twin Towers) like majority of visitors, just go to the Ground Floor of the mall and start at the centre where you can see the Centre Court area located on the Concourse Floor below. From there, head over towards the exit to KLCC Promenade (not to be confused with KLCC Park exit which is on the other side of the Centre Court on the Ground Floor). Once you exit Suria KLCC you’ll be entering the foyer area of the entrance halls of the towers. Here you’ll notice ‘Twin Tower Box Office’ ticket counter on the right hand side. This is however not the ticket counter for the tour. Opposite this ‘Twin Tower Box Office’, there’s a few notice about Petronas Twin Towers Tour next to an opening that leads to an escalator down to Concourse Floor (not to be confused with Suria KLCC’s Concourse Floor) and the ticket counter as well as entrance to the tour. 1. Any time is a good time to do the tour (as long as it’s not raining or hazy ;)) but the most popular tour slots tend to be for sunset. If you plan to do the tour at sunset time, check the sunset hour for the day of your visit and buy the tickets for the tour that starts about 15-20 minutes before sunset time. 2. If you need to access the floor by wheelchair, simply ask one of the staff who would assist you with access via an elevator. Once you’ve got the ticket(s) and the appointed day has come, just head over to KLCC. If you’ve bought the tickets online, you’d still need to go to the ticket counter to receive actual tickets for the tour. So it is better to head there about 5-10 minutes earlier than your tour slot time. There is also a security check at the start of the tour and all big bags and luggage need to be left at the luggage counter. The trip up the tower is done in groups where you’d be escorted by a staff or two who would be at hand to answer any questions that you may have during the tour. The tour starts with a brief introduction to the Twin Towers and the tour itself by the staff while waiting for the elevator up to the Skybridge on the 41st floor. Interestingly, although the elevator is located inside Tower 2, the walls of the elevator is equipped with digital screens that show the view outside of the tower as if you’re travelling in an elevator that has glass windows and is located on the outside of the tower. After the quick trip on the elevator, you’d arrive at 41st floor to exit for the Skybridge that connects the two towers. It is actually a double decker bridge (connecting 41st and 42nd floors on both towers) and is in fact the highest 2-storey bridge in the world. It is located some 170 meters above the ground and is almost 60 meters in length. This is also where Sean Connery and Katherine Zeta-Jones famously abseiled from while trying to escape the authorities in the 1999 film, 'Entrapment'. Trivia: Did you know that the Skybridge is not attached to the towers but has actually been designed to slide in and out of the towers to prevent it from breaking? The view from the Skybridge is rather limited in the sense that it’s not a 360 degrees view from the top as it’s blocked by the two towers. It is still quite a view nevertheless. After some 15-20 minutes on the Skybridge, you’d be escorted to 83rd floor before changing to another elevator to get to 86th floor. Once you get to 86th floor, you’d be rewarded with a panoramic view of the city of Kuala Lumpur and beyond. After about 15 minutes, you and the rest of the group would be escorted down again to the Concourse Floor where your tour ends in the Petronas Twin Towers Gift Shop. If you follow the tips to go on the tour during sunset, it’d be almost dark by the time the tour finishes. It’s recommended that you head over to KLCC Park for some great view of the Twin Towers in the evening while enjoying musical fountain show at KLCC Lake Promenade. Trivia: Did you know that two different construction consortiums – one for each tower – were hired to build Petronas Twin Towers? Have you been on the tour before? If so, what's your take on it? If you're planning a trip to Kuala Lumpur, do check out these hotels in Kuala Lumpur. Never been to the sky bridge, perhaps one day I will. Yes, it was free a few years back but you had to queue for the tickets very early in the morning as you could only get the tickets on the day itself, not in advance. Then they stopped the free tour before starting to sell a tour that includes a meal at the exclusive Petronas Club. The tour cost RM200, if I recall it correctly. They then stopped offering that as well and came up with this tour that combines both the Skybridge and Observation floor on 86th floor. I always thought that we could only go as high as the twin bridge. I really love your photos taken from the 86th floor, especially the one of the other tower's pinnacle. Itu hari kaklong pergi waktu malam, beza gila view malam dengan siang. Malam nampak lampu je banyak, feeling pun romantic je. HAHA.. Tapi tak puas tengok view sebab masa melawat sekejap je tapi bayar mahal. Hi, would it be faster if i book tickets online and collect it on the day itself or it makes no diff to go queue up at the counters to buy? Much faster? I don't think so. It would however be more convenient and you can also ensure that you get the tickets for the day and time that you want. If you go and queue for the tickets on the day that you want to visit, the tickets for that particular time slot could be sold out, especially during weekends & school holidays. Great post. I've just recently come back from KL. We chose to skip the towers which I am beginning to regret a little. Looks like a great view of the city. Definitely a bucketlist item! I had no idea you could tour the towers and the photos you got are amazing. Those are amazing views! It's really cool that the Skybridge is not attached to the towers. I love learning little known facts like this. I wish I had read this post before we visited KL. We turned up (on a very short layover) and all the tickets for the day were sold out. We had no idea they sell out! Oh well at least it's still pretty to look at from the outside....maybe next time we will get see it properly. i visited Malaysia while in High School and this was the number one thing on my to do list! A country full of contrasts. Out of the jungle as you enter the city i was in awe at their enormity! Having never seen anything taker than about 30 stories, these were amazing! unfortunately we were not able to get tickets to the skybridge but we stopped and took lots of great photos from below! Thanks for the great tips about visiting - especially being able to get tickets online. Looks like the views are well worth the effort of getting to the top. Simply gorgeous! I've always wanted to go to the towers. They especially look beautiful at night! I've been to Malaysia and KL so many times but have never done this. I need to do it next time! !